We’d love your help. Let us know what’s wrong with this preview of Smile at Fear by Chögyam Trungpa. Many of us, without even realizing it, are dominated by fear. We might be aware of some of our fears—perhaps we are afraid of public speaking, of financial hardship, or of losing a loved one. Chögyam Trungpa shows us that most of us suffer from a far more pervasive fearfulness: fear of ourselves. We feel ashamed and embarrassed to look at our feelings or acknowledge our st Many of us, without even realizing it, are dominated by fear. We might be aware of some of our fears—perhaps we are afraid of public speaking, of financial hardship, or of losing a loved one. Chögyam Trungpa shows us that most of us suffer from a far more pervasive fearfulness: fear of ourselves. We feel ashamed and embarrassed to look at our feelings or acknowledge our styles of thinking and acting; we don’t want to face the reality of our moment-to-moment experience. It is this fear that keeps us trapped in cycles of suffering, despair, and distress. To ask other readers questions about Smile at Fear, please sign up. Mark Just finished it. I love all of Trungpas books so have to say yes! I keep this book active on my phone's Nook application so when I need an injection of wisdom, it's there. My favorite line so far: "...fearlessness is unconditional because you are neither on the side of success nor on the side of failure. Success and failure are your journey." 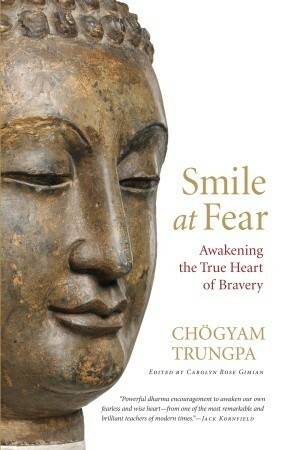 I read this book because I have gained so much insight from Pema Chodron and I needed to learn how to 'smile at fear'. A book is like a river. You never step in the same one twice. The next reading I will pick up, or understand, what I didn't get the first time, or the second, etc. See me smiling. I have read many books on Buddhism - both Tibetan and Zen - but this is my first read by Chogyam Trungpa. People tend to gravitate towards certain teachers, and I simply find Trungpa's style of teaching too confusing due to the overuse of analogies and metaphors. Smile at Fear was an inspiring read until Chapter 7, where it became repetitive and ceased to make any logical sense - again, due to mixed metaphors. While some students respond to this style of teaching, I, personally, prefer logical, s I have read many books on Buddhism - both Tibetan and Zen - but this is my first read by Chogyam Trungpa. People tend to gravitate towards certain teachers, and I simply find Trungpa's style of teaching too confusing due to the overuse of analogies and metaphors. Smile at Fear was an inspiring read until Chapter 7, where it became repetitive and ceased to make any logical sense - again, due to mixed metaphors. While some students respond to this style of teaching, I, personally, prefer logical, straightforward presentations of spiritual or philosophical thought. That said, my biggest and most important takeaway from the book is to re-establish sitting meditation into my daily practice. The one analogy I did appreciate was that of saddling the wild mind like a rider trains and saddles his/her horse. As Trungpa so eloquently states: "We always try to do something with ourselves, rather than simply be with ourselves. If you cannot be with yourself, you cannot find out who you are or where you are. In that case, the essence of what you are is impossible to find." He continues, "Cultivating mindfulness is the attitude that allows us to see ourselves and our world quite accurately and precisely." Meditation is critical in helping us to develop the discipline of mindfulness. Chapter Two presents a wonderful introduction to sitting meditation. Highly recommended. Caveat: this is not a starter book. If you aren't already knowledgeable on Buddhist teachings, this book isn't for you. Highly encouraging read, especially for someone like me who fears quite a bit. But this poses the idea that instead of fleeing from fear or turning our heads each time it pops up, we instead should face our fear and make friends with it. Sounds simple but is actually quite difficult. This lays the path for getting there, and is quite reassuring along the way. There is genuine and deep wealth to be gained by being with our emotions and inviting them to announce their intention and need within our conscious mind. Prescriptive and psychotherapy are invaluable and irreplaceable. At the same time there is room at the table in the discussion of managing mood and being whole by employing meditation, deep awareness, self-talk, and allowing that which comes up to have a voice. Highly recommend. This book was a disappointment. It is the first book of this type that I have found wanting. The author is surely an enlightened individual who can teach us all much about how to live our lives. Unfortunately, this book is not the way. His metaphors are stretched beyond comprehension. Perhaps he assumes that we are familiar with his tradition and we know what he means by the Sun in the West or the Sun in the East, but it just doesn't translate. His analogies are hard to follow and don't even mak This book was a disappointment. It is the first book of this type that I have found wanting. The author is surely an enlightened individual who can teach us all much about how to live our lives. Unfortunately, this book is not the way. His metaphors are stretched beyond comprehension. Perhaps he assumes that we are familiar with his tradition and we know what he means by the Sun in the West or the Sun in the East, but it just doesn't translate. His analogies are hard to follow and don't even make sense. i can't tell if he is trying to help me become fearless or teach me how to help others overcome their fear. This author gives life to the phrase "tortured metaphors." I did get his main point that we already have the tools to be brave within us if we can focus on our true inner self, develop confidence in our self (recognizing that the self is an artificial construct in its own right) and finding our inner calmness and security. Inner confidence makes for outer bravery. I got the message, I just couldn't bear the method. I humbly admit that I could not finish the book. Absolutely ridiculous, impractical, theoretical garbage. A waste of money. Lacking inspiration. Don't buy if you are the pragmatic hands-on type. Even 1 star is too much. I probably would have enjoyed this more if the narrator's voice hadn't been so pretentious and condescending. Great buddhism book on understanding fear and becoming a "warrior". It gets a bit confusing by the end when all concept merges, but still some good insights about facing adversity in life. Extremely dense. This is maybe the first book that I wish I would have read in a book form instead of audiobook. There were several times when I had to stop the book to give myself time to process some of the thoughts/sentences. I even had to rewind some parts to get all the details. I think I'll have to reread this book. Breve nota: Chögyam Trungpa (1940-1987) nasceu no Tibete e já foi reconhecido como uma grande mestre reencarnado. Em 1959, para fugir da perseguição dos comunistas chineses, atravessou os Himalaias a pé e chegou à Índia, onde ficou durante anos. De lá foi pra Inglaterra, onde ensinou meditação e, quando se casou, foi para os Estados Unidos e aí permaneceu. Ele foi um dos primeiros mestres tibetanos a ensinar o budismo em inglês, fundou inúmeros centros, teve centenas de discípulos – entre eles, Breve nota: Chögyam Trungpa (1940-1987) nasceu no Tibete e já foi reconhecido como uma grande mestre reencarnado. Em 1959, para fugir da perseguição dos comunistas chineses, atravessou os Himalaias a pé e chegou à Índia, onde ficou durante anos. De lá foi pra Inglaterra, onde ensinou meditação e, quando se casou, foi para os Estados Unidos e aí permaneceu. Ele foi um dos primeiros mestres tibetanos a ensinar o budismo em inglês, fundou inúmeros centros, teve centenas de discípulos – entre eles, a famosa Pema Chödrön, autora de Quando Tudo se Desfaz – e criou o programa Shambhala de meditação. Não foi pouco, ainda mais para uma curta vida. Neste livro, organizado por Carolyn Rose Gimian, Chögyam usa a metáfora do guerreiro para mostrar como devemos enfrentar com coragem o medo. Contém alguns exemplos pessoais – que sempre ficam parecendo excessivamente cabotinos fora do círculo de admiração de um mestre – , e inúmeras historinhas edificantes. No final, a mensagem é pra que você medite. O medo sempre estará lá. A coragem pode ser adquirida – mas apenas se houver meditação. Prefiro o livro de Pema: é mais carinhoso, mais real, mais próximo. Mas não sou discípula de Chögyam, então posso estar equivocada. Cabe a você decidir. Trouxe amostras que talvez o ajudem. The worlds greatest fear, the book suggests is the fear of ourselves. We feel ashamed and embarrassed to look at our feelings or acknowledge our styles of thinking and acting; we don’t want to face the reality of our moment-to-moment experience. It is this fear that keeps us trapped in cycles of suffering, despair, and distress.To conquer the fear, the book suggests every one of us to be ourselves. It suggests us to look at the fear, explore it rather than avoiding it. A fearless person is a per The worlds greatest fear, the book suggests is the fear of ourselves. We feel ashamed and embarrassed to look at our feelings or acknowledge our styles of thinking and acting; we don’t want to face the reality of our moment-to-moment experience. It is this fear that keeps us trapped in cycles of suffering, despair, and distress.To conquer the fear, the book suggests every one of us to be ourselves. It suggests us to look at the fear, explore it rather than avoiding it. A fearless person is a person who faces each moment of life with openness and fearlessness. “The ultimate definition of bravery is not being afraid of who you are,” writes Chögyam Trungpa. This book is filled with so many gems like "fearlessness is unconditional because you are neither on the side of success nor on the side of failure. Success and failure are your journey." Remember this.When you are frightened by something, you have to relate with fear, explore why you are frightened, and develop some sense of conviction. You can actually look at fear. Then fear ceases to be the dominant situation that is going to defeat you. Fear can be conquered. You can be free from fear, if you realize that fear is not the ogre. You can step on fear, and therefore you can attain what is known as fearlessness. But that requires that, when you see fear, you smile. This book articulated some things that I had put words to in the past, but hadn't heard anyone else put words to before. It was an uncanny and marvelous experience. I do think that some things here are intuitive, and others feel vague. I think the book is more meaningful when I am fully engaged in listening (I did audiobook), rather than distracted by anything else. Seems obvious, but you do have to focus to get the full meaning, and sometimes go back and listen to parts again. I thought it would This book articulated some things that I had put words to in the past, but hadn't heard anyone else put words to before. It was an uncanny and marvelous experience. Not sure I can do this book justice. Basically from what I gathered the author is advocating conquering fear through the use of meditation and compassion. Through opening ourselves, making ourselves vulnerable, we learn to receive the challenges of life with a compassionate heart. This doesn't mean we don't suffer or feel pain, but it helps us break out of the cycle of despair. Surprisingly his concept of non-aggression is not what most would think. He is not advocating Pacifism, but instead if v Not sure I can do this book justice. Basically from what I gathered the author is advocating conquering fear through the use of meditation and compassion. Through opening ourselves, making ourselves vulnerable, we learn to receive the challenges of life with a compassionate heart. This doesn't mean we don't suffer or feel pain, but it helps us break out of the cycle of despair. Through a dark time, feeling lost and empty, hopeless, I picked this book up and it completely rearranged my perspective. Like a phoenix rising from the ashes, this book made me realize the true potential resting inside. "Smile at Fear" is one of the few books I have read over and over. The words of Chogyam Trungpa are like a favorite blanket, one with the warmest hug and most comforting smells, enveloping you in a sense of self love in that present moment. Presented as "non-secular" (no religious Through a dark time, feeling lost and empty, hopeless, I picked this book up and it completely rearranged my perspective. Like a phoenix rising from the ashes, this book made me realize the true potential resting inside. A great and concise overview of the Shambhala Warrior path of Trungpa's Tibetan Buddhism. As much as there may be reasons to question the Shambhala teaching methods and structure, the qualities of Tibetan Buddhist practice are very useful all the same. This particular book tends to focus, as the title would suggest, on relating to fear and thus anxiety issues. I think some of the more esoteric aspects of Windhorse training near the end could be made clearer for practice methods, but good to liste A great and concise overview of the Shambhala Warrior path of Trungpa's Tibetan Buddhism. As much as there may be reasons to question the Shambhala teaching methods and structure, the qualities of Tibetan Buddhist practice are very useful all the same. This particular book tends to focus, as the title would suggest, on relating to fear and thus anxiety issues. I think some of the more esoteric aspects of Windhorse training near the end could be made clearer for practice methods, but good to listen to often enough to get the message clearer. Gandrīz droši tā nav grāmatas vaina, ka zvaigznītes ir tikai trīs. Bet varbūt tomēr. Lūk, citāts no līdzības, ar kuras palīdzību padalos, kāpēc zvaigznītes ir tikai trīs. Svētītais reiz dzīvoja Kosambi rožkoku mežā. Viņš paņēma rokā dažas lapas un jautāja bhikkus: "Kā jūs domājat, bhikkus, kur ir vairāk lapu - manā rokā vai mežā kokos?" "Lapas, ko Svētītais ir paņēmis rokā, ir tikai dažas, Kungs; mežā to ir daudz vairāk." "Tāpat, bhikkus, to lietu, ko esmu izzinājis tiešas zināšanas ceļā, ir daudz v Gandrīz droši tā nav grāmatas vaina, ka zvaigznītes ir tikai trīs. Bet varbūt tomēr. "Tāpat, bhikkus, to lietu, ko esmu izzinājis tiešas zināšanas ceļā, ir daudz vairāk, nekā esmu jums pastāstījis." This is the third work (with only the first being edited when he was alive). I found it hard to comprehend at moments, but overall extremely helpful and illuminating. I appreciated concepts such as fear being needed to create fearlessness, and the idea of success and failure both sowing seeds of understanding... the idea that we are where we need to be right now. That we can take on a warrior spirit at any point and take joy and laughter at what is. This was a surprise and a delight. I listened to the new audio version, and the humor of this just shines. Yes it's sort of a primer for Buddhist thought as well, but the conversational tone and the marvelous way things are said make the book so much more. I love that in a book, I love it when words are able to make me laugh and think at the same time, and if it is even better with a second listen, oh double plus good, right? Marrakesh could be a foody place. Sandro is all-good isn't it? I live on tea and porridge at the moment. Basically good A<3 Trumorrow. I'm not sure how accessible this book would be for folks who are not already familiar with Chogyam Trungpa and his teachings. I found it a helpful collection of material, clearly written, that pulls together in a new format things I have heard in different places. I'll look at this again, I suspect, possibly dipping into it at different places for different reasons when I need a refresher about fearlessness and genuineness. Although not a buddhist myself I have read many buddhist books and found them interesting and useful. This I did not and gave up half way through. I did not like the bad language and the use of illustrations. Perhaps a bad translation, but there are other books more enlightening, I would not recommend this one. This book was suggested to me as a different way of looking at the warrior. Many friends had encouraged me to embrace my warrior side but I associated the word "warrior" with violence. In this book Trungpa describes the type of warrior that could (and does) change the world through non-violence. I would recommend this to anyone wishing to be a peaceful warrior. Again, Trungpa has lots of pithy and realistic things to say about meditation and enlightened society here, but there's not much new here--just the same messages I've read in his other books, but communicated in a somewhat different way. It has made me want to practice more, though, so at least there's that. I wish I had read this years ago. Maybe I wouldn’t have been able to hear it as well as right now, but if you are already on your spiritual path and looking for a way to work with fear, this is it. Trungpa provides both a stance towards working with fear within one’s self, as well as the warrior stance in the Shambahala tradition. I have read many Buddhist teachings, generally as a guide to my meditations. However, I found many powerful messages in this book that were equally challenging and reassuring. "Smile at Fear" has given me a starting point to build a pathway toward peaceful and meditative warriorship, a concept I did not understand enough to pursue. This book is so inspiring. I go back to this book time to time when I need that extra wisdom. The author tells it like is but yet does it in an inspiring and understandable way. The author gives descriptive understanding of each path thats discussed which gives one a better understand of the points that are being conveyed.